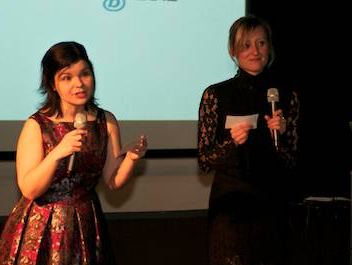 Catherine Hanrahan & Dani Stover hosting last yearThe 2nd Annual #Petertweeter Awards, celebrating the best of Twitter and social networking in Peterborough and area, will take place March 21st at the downtown nightclub ARIA. The first #Petertweeter awards last year at Splice were a huge success—view pictures here—and this year will certainly carry on that momentum. The awards show will again be hosted by Catherine Hanrahan and Dani Stover—the Tina Fey and Amy Poehler of Peterborough—and will spotlight individuals, businesses, non-profits and more. For more information, contact donald@smallprint.ca or call 705.977.0604.